Spring 2018 - 80+k Price Reduction, now only 219. Owner says " Get it Sold" Although this is an unbelievable price the Owner is open to negotiation. 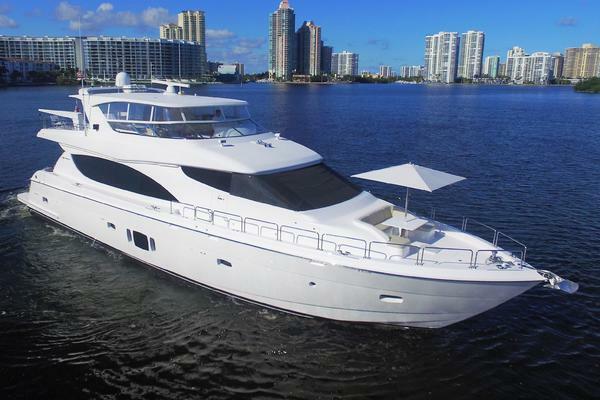 She is the best priced 65 Hatteras on the market for any that are even remotely close to the condition. With Low Hours and LOTS of Updates She is a Great Buy at this price. Most boats in this price range will require a few to many thousand dollars spent on her to be seaworthy and safe. This 65 is ready to go and is used on a regular basis. From Power Boat Guide in 2016, " The Hatteras 65 Convertible remains the best selling sportfishing boat her size ever built" This Hatteras 65 has had a very significant amount of updates in the past two years to include: - All New 4 Side Enclosures - All New Cushions, Bridge and Cockpit - Interior updates including Carpet,Furniture Coverings and More - Engines are serviced routinely and She is used on a regular basis. - NAIAD Stabilizers The overall condition of this 65 Hatteras is ReallyGreat. She appears to havehad light use during her life time and shows no signs of abuse of neglect. The engine room is clean and well organized and no signs of lots of changes to the original equipment. She is fully equipped with all the Navigation Equipment and Comfort Amenities toEnsure the Owners with aGreat Cruisingor Fishing Experienceto virtually any location in the World. With her 183 sq feet ofTeak Cockpit, two 20KW Onan Generators, Stabilzers, Updated Interior, Glossy Exterior and Classic Linesthe Owners and Guest will Fish and Cruise in Comfort and Style. This Hatteras is definitely worth serious consideration if you are looking at any Sport Fishing Vessel in the 60-70 foot class. A whole lot of boat for not a lot of money. She is used on a regular basis but mostly for day trips so the hours are still low. She stays in "ready to fish" condition and should offer the new Owners many many years of enjoyment. United Yacht Sales New Jersey would love to guide you through a personal showing of this 65' Hatteras 65 Convertible 1987. This yacht for sale is located in Destin, Florida and priced at $219,000. For a showing please contact us by filling out the form on this page and we will get back to you shortly! Massive Salon with separate Galley up and raised Dinette. Below to port is the VIP Guest State Room with private Head and Shower and Cedar Lined Hanging Locker. To Starboard is the Guest State Room with Two Bunks and private Head and Shower. Guest SR also has entry to pump room. Forward is the Master State RoomwithFull Size Island Berth, PrivateHead with Full Shower and Bath Tub, Two large drawer storage cabinets and Closet with Bi-Fold Doors .Please note the forward AC Unit needs repair as of 3/16/18. - NIAD Stabilizers - Two ONAN 20 KW Generators, Hours - 2375port, 2295 Stbd - Twin MTU 8V Engines with 1750 Original Hours - At 1700 She Cruises 21 knots and at 2000 24 Knots, Very Respectable for a 65. - Windlass - FLIR Night Vision - Full Array of Electronics - Several recent updates and services to engines and mechanical systems.